Last Sunday’s draw at home against Cruzeiro was very disappointing. Palmeiras were holding all the cards but again were unable to assert superiority, allowing Cruzeiro to level up with five minutes to go. Assunção, who has scored two free kick goals on stoppage time in the last three games, this time blew a penalty at 46 minutes of the second half. Tragic. Unfortunate. Even unlucky. Palmeiras were playing well and deserved the three points. The team crumbles under pressure. And important (and expensive) players are not up to standards or absent. Valdivia is serving the Chilean national team. Or was, rather: yesterday it was announced that he’s got a muscular problem and will be approximately four weeks off the pitch. Kleber has not been the same since that episode relating to salaries and the threat of him transferring to Flamengo. Our “Gladiator” seem to have turned into a flower, frequently feeling “pains” the day before a game and watching from the sideline. Well, at least we got rid of Lincoln. Scolari has indicated that he will adopt a different posture from now on, as Palmeiras are in no danger of relegation (knock on wood) but are losing out on opportunities to approach the top four teams in the championship. Having the competition’s best defence is not enough: more goals are needed, especially when playing away. Thus, expect a more offensive team as of today against Atlético Paranaense. The 2012 Summer Olympic Games are scheduled to take place in London from 27 July to 12 August 2012, becoming the first city to officially host the modern Olympic Games three times, having previously done so in 1908 and in 1948. London was elected as the host city in 2005, defeating Moscow, New York City, Madrid and Paris. The 2012 Olympic and Paralympic Games will use a mixture of new venues, existing and historic facilities, and temporary facilities. The organisers’ intention is that there will be no “white elephants” after the Games; some of the new facilities will be reused in their Olympic form, while others, including the 80.000 seater main stadium, will be reduced in size or relocated elsewhere in the UK. The costs of mounting the Games are separate from those for building the venues and infrastructure: while the Games are privately funded, the venues and Park costs are met largely by public money. The total cost for the Games and the regeneration of the East London area is estimated at roughly U$ 15 billion, which includes U$ 3.2 billion from the private sector by a combination of sponsorship, merchandising, ticketing and broadcast rights in order to stage the Games. With less than one year to go, the Games construction is 88 per cent complete, ahead of time and under budget. 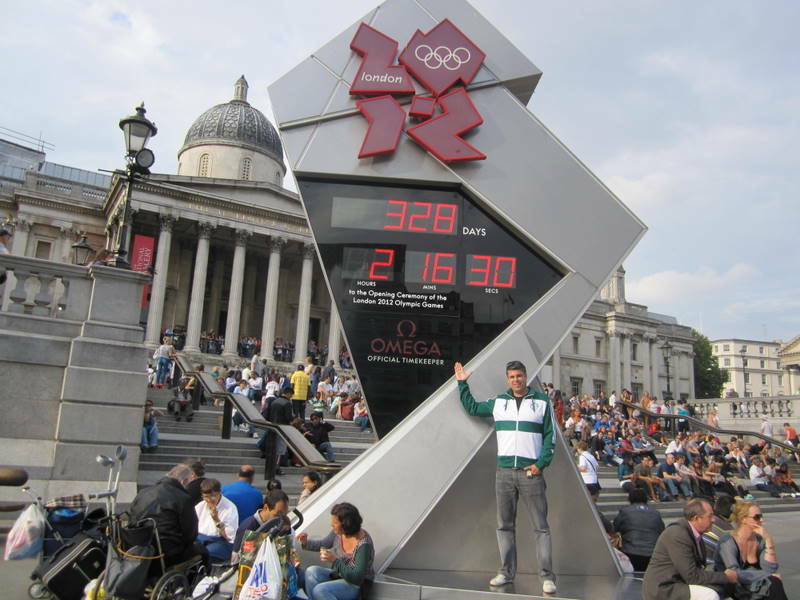 A digital clock, located in Trafalgar Square, does the countdown to the opening ceremony. My vacations are now over and I’m back in Brazil. I guarantee you fewer half-baked posts and no more pictures of my pretty face for a considerable time. Promise.